BEAUTIFUL SUMMER RENTAL Nr ACADIA NATIONAL PARK & BAR HARBOR! !! Beautiful summer rental - CLOSE TO ACADIA NATIONAL PARK & BAR HARBOR! GREAT LOCATION!! DON'T LEAVE IT TO LATE, GET THAT SUMMER DATE EVERYONE ELSE IS STARTING TO LOOK FOR! BOOK NOW! NOW TAKING BOOKINGS!! Located in Southwest Harbor known as the quiet side of Mount Desert Island, minutes from downtown shops and restaurants.The property is set back off Main Street and next to the golf course! The property is less than a 2 minute drive to Echo lake which has its own beach with lifeguards and much warmer water than the ocean, water reaches 75 degrees in the summer VERY NICE FOR A RELAXING SWIM OR JUST RELAX THE DAY AWAY WITH A BOOK. But if you prefer the Ocean We are minutes from that as well, We have Sand beach that is in the Acadia National Park. Its is also close to the stop for the free Island Explorer shuttle bus that serves the entire Island. Southwest Harbor is 15 minutes drive from Bar Harbor and minutes from Acadia National Park, hiking, biking, kayaking, whale watching and all of nearby attractions. Property overveiw: This condo style rental has 2 bedrooms and 1 bathroom - It has a loft bedroom with 1 Queen bed. 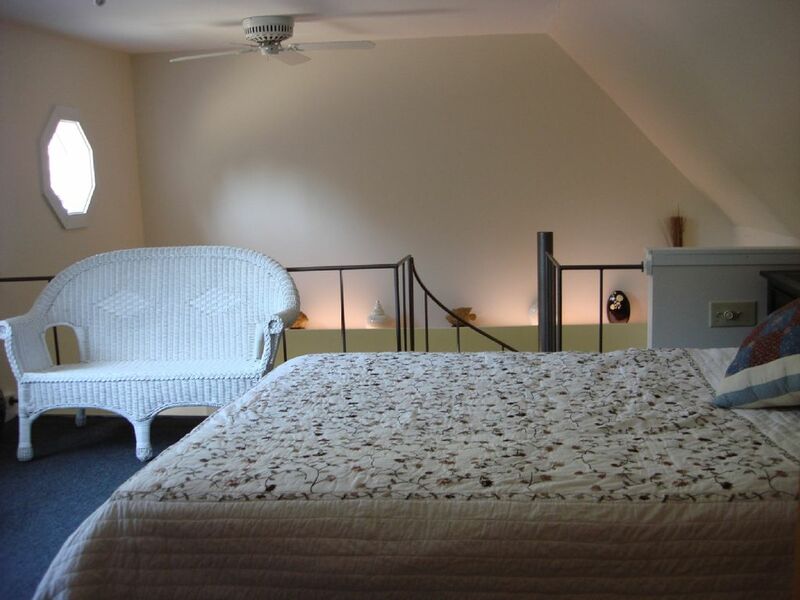 The second bedroom is on the ground floor and has 1 x Queen Bed + 1 x Twin bed. It will sleep a total of 5 people. The lounge has 2 and 3 seat sofas plus lounge chair, LED roku app T.V. inc cable channels, Netflix etc, etc + free wireless internet conection. Family owned and run. We have Four rental cottages at this location. We keep one for ourselves, the other Three we rent. They are all beautifully set up with everything you will need for a comfortable and enjoyable vacation. We include free cable t.v. WiFi internet connection, one time linen set up, bathroom towels, gas grill and bench set for the garden. etc...etc... JUST TAKE A LOOK AT THE PICTURES!! Newly refurbished this year, close to everything on the Island of 'Mount Desert Island' it is 15minutes to the main entrance of ACADIA NATIONAL PARK, 20 minutes to BAR HARBOR. 2 minutes to ECHO LAKE BEACH!! (One of the most popular places on the Island, it has a sand beach plus lifeguards!) and we are just a few minutes from Southwest Harbor town! It was clean, neat and comfortable. It had everything we needed. C’était la deuxième fois que je louais un chalet chez M. Cléments et je le recommande fortement. Très propre, bien équipé en accessoires, bien situé, lac à proximité et épicerie à 300 mètres. À peine 25 km du Parc Loop et de Bar Harbor. The unit was very nice and clean. It had everything we would need and was very comfortable. The unit was perfect, more roomy than expected. The location was great! Close and convenient to everything. Echo Lake was right there. The drive to Bar Harbor was about 15 minutes. VERY close to restaurants and a food market. Overall a great experience. Would definitely return if lucky enough to get back to Maine. Clean, quiet, comfortable, relaxing. The location of this property was perfect for our stay. It was close enough to everything we wanted to do, but distant enough to give us some peace and quiet. Our host was outstanding. Market and laundromat were one minute away. Perfect getaway. Already looking forward to going back. Lovely house and fabulous area to stay in. The space was nice enough. We appreciated the grill and other amenities, although there were no drinking glasses for kids. It was a challenge to find somewhere to store our food where tiny ants wouldn't get to it. There were 4 beach towels, which was a pleasant surprise. The location was great and easy. There is plenty to do and see on Mount Desert Island. There is the obvious attraction of Acadia National Park and all it offers. There is the charm of Bar Harbor, offering evening shopping and restaurants galore! There is also : Whale watching / Lobster boat tours / Sail boat trips / Sea fishing / Fresh water fishing / Water Taxis to the surrounding Islands / Horse drawn carriage rides (from Jordon Pond House, a beautiful part of the park) / Sand Beach also in the park / Echo Lake Beach, in Southwest Harbor (a very popular beach with locals & tourists alike, offering restrooms, changing facilities and lifeguards) a great way to laze away a day! / and lots more, so come and rent our place and get some more useful tips from us!